In the last post, we answered some questions regarding how does induction hardening work. However, understanding the processes in full, as well as the many benefits it provides, is the key to choosing the heat treatment method that's right for you. 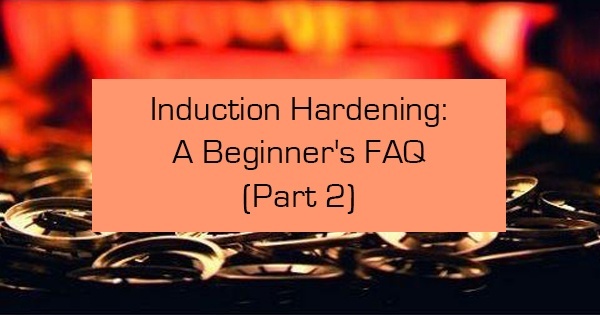 Here's part two of our induction hardening FAQ for beginners. How does induction hardening work to improve and preserve wear resistance? The process of induction hardening is used to increase wear resistance, fatigue life, and surface hardness by creating a hardened layer without affecting core microstructures. This process can also be performed selectively, with certain components remaining unaffected. Keep in mind that low alloyed medium carbon steels with induction hardened surfaces are often used for imperative automotive and industrial applications. These applications typically require high wear resistance, and the specific behavior of wear resistance in relation to induction hardened components and surfaces is highly dependent on both hardening depth and the distribution and magnitude of the surface layer's residual compressive stress. What's the difference between single shot hardening and traverse hardening? There are two methods of heating when using induction: eddy current heating and hysteretic heating. When it comes to hardening, however, the two main types are known as single shot hardening and traverse hardening. Single shot hardening systems employ the use of rotated components in the induction coil, and the entire area is heated at the same time for a pre-determined amount of time using either a drop quench system or a flood quench system. Single shot hardening is typically used in applications in which no other method will reach the intended result, for example, hardening the flat face of hammers and producing small gears. Traverse hardening, on the other hand, uses an induction coil for the workpiece to pass through progressively. A following quench spray or ring is used, This process is often used in the manufacturing of shaft type components, including axle shafts, steering components, drive shafts, excavator bucket pins, and power tool shafts. The workpiece is passed through a ring type inductor, which usually features a single turn. Traverse hardening applications are also used in the manufacturing of certain edge components, including paper knives, lawnmower bottom blades, hacksaw blades, and leather knives. Ultimately, understanding the processes and details of various induction hardening methods is the key to determining which heat treatment type is best suited for your application needs. For more information about induction heating accessories and other induction equipment for sale, contact Ambrell Corporation.